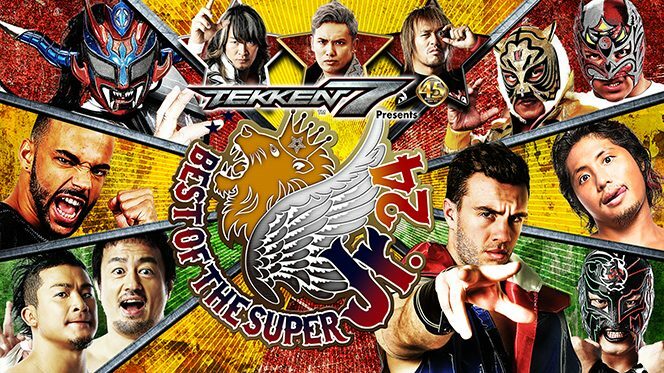 After thirteen shows, we’ve finally reached the end of the Best of the Super Juniors XXIV. It’s my third tournament and it was much better than 2015 and about on par, if not a bit better than 2016. The finals were great the last two years (2015 got ****½ while 2016 got ****). This year we have an unexciting finals, but one that should deliver in quality. Sounds like a lot of NJPW booking right? El Desperado, TAKA Michinoku and Yoshinobu Kanemaru vs. Jushin Thunder Liger, Tiger Mask IV and Volador Jr.
Post-match, Tetsuya Naito cut a promo and out came Hiroshi Tanahashi. He claimed that Naito tells people to relax, so he did. He’ll be at Dominion for their match. At the end of the day, my biggest gripe with NJPW continues to be the booking. They did the come from behind win just like Ospreay had last year. Now, the Jr. Title match at Dominion is ANOTHER Wrestle Kingdom rematch. Could you imagine the outcry if WWE put on a great WrestleMania and SummerSlam was just a retread of that show? It’s like there’s been no growth in six months. There were lots of interesting opportunities to go with out of this tournament, but they went the safe route. Take a chance. They did it with Omega and it paid off. Take more risks. NJPW gets away with a lot of their safe, stale booking because the in-ring product delivers. I’m sure Dominion will be a damn good show, just not an exciting one. Overall: 7.5/10. Pretty much the show I expected. NJPW tends to have events with solid tag matches filling the undercard and then a big finish. The only things that I say need to be seen are the LIDJ tag and the main event. A show like this is all about the main though, and that delivered. I’m not a fan of the booking, but the wrestling was great.